Omega-H3 Liquid provides a concentrated blend of 18 bio-elements, including vitamins, minerals, amino acids and Swiss Alpine Malt. The comprehensive formula has been developed from extensive research by highly qualified biochemists and nutritionists. 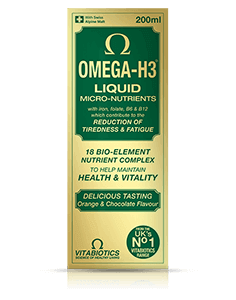 Omega-H3 Liquid comes in great tasting orange & chocolate flavour. This first ever liquid formulation from the world renowned Omega-H3 range is ideal for those who prefer an alternative to capsules. The advanced Omega-H3 Liquid includes thiamin (vitamin B1) which contributes to the normal function of the heart and nervous system, as well as vitamin B12 which helps to support normal red blood cell formation. Vitamins B6 and B12, iron and folate which contribute to the reduction of tiredness and fatigue, plus copper which supports normal energy release. Natural Sweeteners (Raw Cane Sugar, Glucose Liquid [Sulphites]), Malt Extract (from Barley), Purified Water, Acidity Regulators (Sodium Citrate, Citric Acid), Propylene Glycol, Vitamin C (Ascorbic Acid), Iron (Ferric Ammonium Citrate), Lysine HCl, Natural flavourings (Orange Extract, Chocolate Orange Flavouring), Zinc Sulphate, Niacin (Nicotinamide), Caprylic/Capric Triglyceride, Vitamin B1(Thiamin HCl), Thickening Agent (Xanthan Gum), Vitamin E (DL-Alpha Tocopheryl Acetate), Vitamin B6 (Pyridoxine HCl), Histidine, Preservative (Potassium Sorbate), Pantothenic Acid (D-Panthenol), Copper Sulphate, Vitamin B2 (Riboflavin), Manganese Sulphate, Vitamin D3, Folic Acid (as Pteroylmonoglutamic Acid), Sodium Hydroxide, Potassium Iodide, Vitamin B12 (Cyanocobalamin), Biotin. Allergy Advice: For allergens, including cereals containing gluten, see ingredients in bold. 1 teaspoonful 2 times daily. Half a teaspoonful twice daily. 1 teaspoonful 1-2 times daily. Food supplements must not replace a varied and balanced diet and a healthy lifestyle. As with other food supplements, seek professional advice before consuming if you are under medical supervision, pregnant, breast-feeding, suffer from food allergies, or are allergic to any of the ingredients. This product contains iron, which if taken in excess may be harmful to very young children. Store below 25°C, in a dry place, out of sight and reach of children. Why has Omega-H3 Liquid been developed? When is Omega-H3 Liquid recommended? Can Omega-H3 Liquid be used simultaneously with medications? How should Omega-H3 Liquid be used? 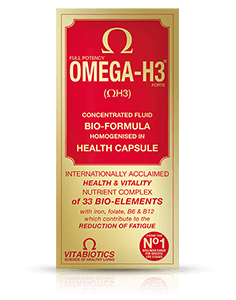 Are there any undesired effects whilst taking Omega-H3 Liquid? Is Omega-H3 Liquid recommended with any other Vitabiotics product(s)? Is Omega-H3 Liquid suitable for vegetarians? ADULTS: (men and women): 1 teaspoonful 2 times daily. CHILDREN: (3-6 years): Half (1/2) a teaspoonful twice daily. CHILDREN: (7-12 years): 1 teaspoonful 1-2 times daily. Always read the product directions before use. Do not exceed the recommended intake. As with other food supplements seek professional advice before using if you are pregnant, breastfeeding or suffer from food allergies, and consult your doctor or pharmacist if you have an underlying medical condition, or if on medication. Vitamin supplements are not intended to treat or prevent any disease. Food supplements must not replace a balanced and varied diet, and a healthy lifestyle. Please note that any health tips or advice provided on this site are not intended as, and should not be regarded as a substitute for medical advice from your doctor or health professional.